Ahead of his next film, Tamil actor Dhanush talks about being pushed into acting as a 16-year-old, his father’s struggle and being judged by his appearance. Question: You made your Hindi film debut with Aanand L Rai’s Raanjhana. Your second is with R Balki (Shamitabh). It’s quite an impressive way to start. Dhanush: They are the best first two films I could have done. After Raanjhana, I patiently waited for the right script to come by. I read close to 30 scripts, but when Balki narrated Shamitabh, I knew this is it, this is the film for me. Ques: How was it growing up in a film family? Dhanush: I come from a very humble background. My father had to work really hard to become an assistant director. For a large part of his youth, he worked in a mill and took up odd jobs to make ends meet. We lived in a small room and could only afford a meal a day. Dad would walk 11km every day to save a rupee of bus fare so we could go to school. I’ve seen poverty up close until I was four or five. But dad was a writer from a young age. Even while working in the mill, he would write stories and scripts and sell it to people for Rs 50 or so. They would then sell the stories to directors and producers as their own. Through one such contact, he got a break in the Tamil film industry as an assistant director. He must have been in his late 30s then. He worked hard for 15 years before making his directorial debut. Ques: Did you rebel when your parents asked you to act in a film? around people makes me nervous. But I’m very comfortable in front of the camera, and this I realised many films later. Ques: Were you comfortable in front of the camera the first time, when you acted in your father’s Thulluvadho Illamai (2002)? Dhanush: I didn’t care about the medium so I was confident but I also knew I’d be ripped apart by critics. I was. The first review had a line that said: “We don’t understand with what guts he came and stood in front of the camera.” I read that and started crying as I was very young. But my concern wasn’t that my work had been panned, I was worried about what my aunt or uncle would say, that my cousins would now tease me (laughs). Ques: You won the National Award for Best Actor trophy for Aadukalam in 2011, making you, at 27, the youngest male lead to win the title. Ques: Lead actors are judged also for their appearance. At 16, were you prepared for the onslaught you got? Dhanush: I knew, even then, that my looks would be criticised. I can look into a mirror, no? But being a director’s son, I also knew that only the script matters, not looks. Whatever is in those pages can create a star out of an actor, no matter how he looks. Or bring him down too. Ques: What gave you the courage to undergo the same journey the second time in Bollywood? Dhanush: This time, too, I knew my looks would be criticised, but this time I enjoyed the process of being judged because I expected it. Each time I saw a story or review, I would smile and think: “Oh, I’ve seen this before. Oh, that’s not new either.” I was also older, 29, when Raanjhana released (2013), and thus more mature. Actor Dhanush, who will be seen in “Shamitabh”, Tuesday said he is ready to experiment with roles in Bollywood as he has nothing to lose here. Ques: But the success of Kolaveri di, in a way, set the stage for you. 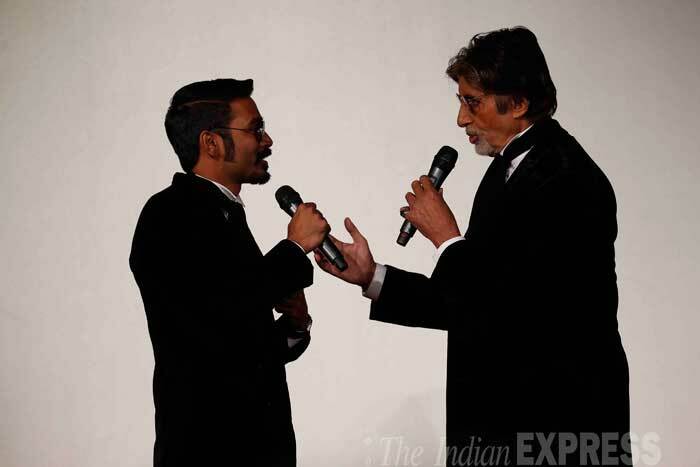 Dhanush: I cannot deny what the song’s done for me, but Raanjhana, and my character, Kundan, did the magic for me. Of course, Kolaveri di is a phenomenon with no explanation and I can’t get rid of that even today, four years later. Sometimes I get irritated that the song doesn’t leave me. Ques: You’ve largely done romantic roles in Tamil films, and your Bollywood debut was a love story too. Dhanush: It’s a typical journey for any young actor. In Bollywood, I took up Raanjhana because I could relate to Kundan, I had felt similar love for a girl at that same age as the character I play. But my preferred genre is comedy, I believe it’s my forte. But I’d love to do a negative role, there’s so much to do, so much to play with. A villain can be stylish and his actions don’t have to be explained. Heroes are boring in comparison, even anti-heroes, as there’s always a justification for their bad actions. Ques: You are also superstar Rajinikanth’s son-in-law. Dhanush: It’s great to be that. There is no comparison, he is a phenomenon. I prefer being called director Aishwarya Dhanush’s husband. She and I share our passion for cinema, but at home, we hardly talk about it. Instead, we share other interests. We travel a lot, Aishwarya loves gambling and got me hooked to it too. She also loves shopping and I love to carry her bags. We’ve been married for almost a decade now and have two boys. They both look like me, which I love and which they’ll hate once they grow up (laughs). Ques: You started out so young. Do you have any regrets about that? Dhanush: Well, I didn’t complete my education, I cannot speak good English. And I missed a whole chapter in my life —youth, the age between 16 and 25. I haven’t experienced college life. It’s the phase that my character in Raanjhana is set in. But it isn’t that bad either, I have nearly 30 films behind me and a National Award to boot.